Its a mission, not a holiday, but its one of those things that the more you've put into it the more satisfying it is when you succeed. Your team now has 4 years of being the current world champions, thoroughly deserved. I would just like to point out how relevant Tims underquote is..... He's had it there all along. "We don't rise to the level of our expectations, we fall to the level of our training. Archilochos 680-645 BC"
Last edited by DaveMc on Sat Aug 19, 2017 6:28 am, edited 1 time in total. Some good articles in accurateshooter.com - a few days back for rod, then a mention in Litz's article on the Aussie wind coaching system and finally the teams today. We need to get a good team photo to them...Anyone??? - also please send to me - I need it framed and "straight to the poolroom"
I am sure Jamie will not mind me posting this here as it will get to the team. I just read the subject heading more closely!!... Can I take it you guys took out the Trophy!??!!! WOOHOOO!!! AWESOME! Well done to the whole team!!! I look forward to hearing the stories and celebrations when you get home! Enjoy the respect and pride of being at the top of the world! We are proud to support you guys! Farley front rest on my own light base which won't be coming off. Recoil pad is a slip on limbsaver which works really well. Craig McGowan wrote: No 5 star hotels for this World Championships team. Hard concrete and no sleep for 24 hours. Greg looks quite at home there actually...... maybe he's used to sleeping on the floor?? In any case, he's earned his rest. On a brighter note, Old Qubec city is a great place. Hopefully you had something nice to eat as we did. Next time you beat the host country in a World Championship you can look further to more than just a hard tile bed for a few hours. I reckon the morning wash will be some water boarding. On a lighter note, Tim and I drove to Mont Tremblanc ski resort for a lovely lunch them off to Quebec City where we did some sightseeing in the old town for Saturday night. The free room upgrade was a great touch. I wanted to sleep in, in our Suite Presidential but must be off for a sight seeing tour after we finish the buffet in bed. If you are still at the airport when we get there I will share pictures, it has been lovely. Congrats and well done to all that competed in Canada, outstanding you should be very proud of your achievements. I guess Steve laz and Marty are still pushing their beds together ? Don't think Lisa would be agreeable to that , Josh! This gold medal has been brought to its new and permanent home in Australia wrested from a country from the far side of the earth where it was won. It is alongside it's brother from four years ago, also won and brought home from the far side of the globe. The picture is deliberately and deceptively basic. Within that simplicity lies a tribute to the level of effort, planning and discipline necessary to put those two items in the same space at the same time. I hope that this simple picture may be a tribute to all Australian F Class shooters so that they may all share in, and be a part of the huge sense of pride which the team felt over in Canada. After all, the parallel of this simple picture is that the simple beauty of Australian F Class is that we are all united as one big extended family. Furthermore, I hope that it also gives our Australian F Class family a sense of pride in knowing that our brothers and sisters are truly and deeply respected at world level and in so doing we show the world that Australian standards and our heads can be held high. Whether you know it or not, everyone in Australia who has ever been an F Class competitor at any level has contributed to setting and elevating our standard of shooting in Australia. Without this involvement and competition, our skills and technical expertise would never improve. 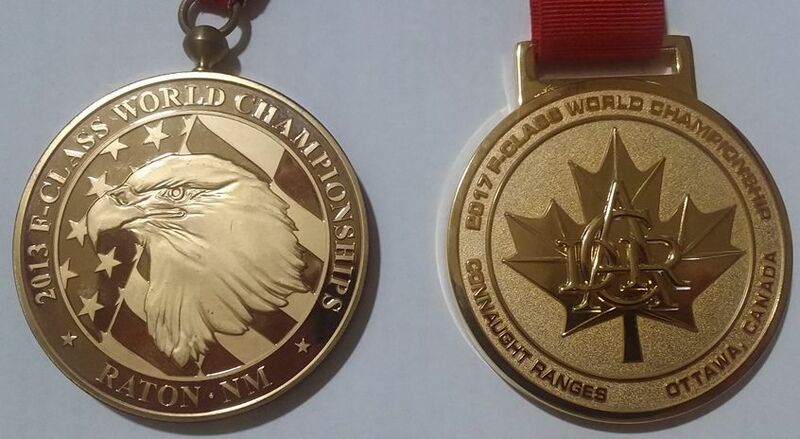 So, I would say that in that context, credit for these two gold medals should also equally go to every Australian F Class shooter who is or ever was a part of our sport. So for you all, know that whilst this is a deceptively simple picture, I hope you feel a great sense of collective pride given that all of you have been an intrinsic part of both the journey and the result. you lay bare your passion with words of inspiration. "..the simple beauty of Australian F Class is that we are all united as one big extended family."